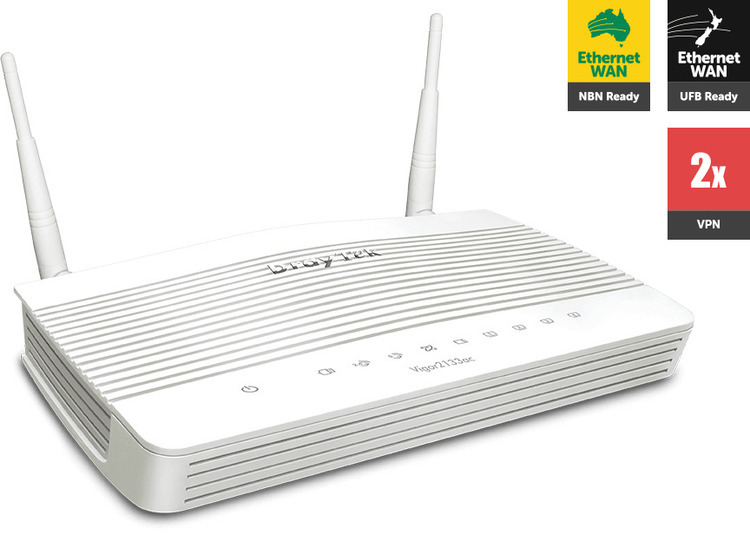 The DrayTek Vigor2133ac high-performance router is designed for super-fast broadband networks. Features include 1x Gigabit Ethernet WAN port for Internet access and 3G/4G backup provided via the 2 USB ports by attaching a supported 3G/4G USB modem. The support of 802.1Q VLAN on WAN enables the router to provide triple-play services to your home network. Business-grade features include extensive Firewall with Content Filtering, VPN, Bandwidth Management, making the Vigor2133ac router a perfect solution for home office and teleworkers. 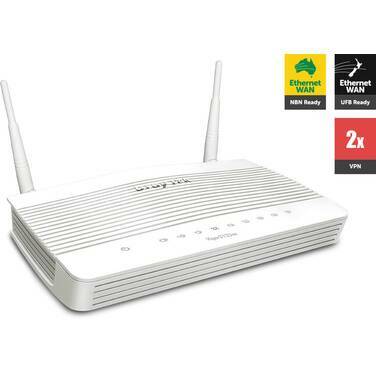 The Vigor2133ac router includes integrated 802.11ac dual-band Wi-Fi delivering wireless throughput up to 867 Mbps. Business-grade features include AirTime Fairness, Router-Assisted Roaming, and Band-Steering ensuring smooth wireless connections for HD videos, gaming, and internet phones. The Vigor2133ac router has the “QoS” feature to guarantee priority for VoIP calls. This ensures good call quality even when the Internet bandwidth is limited. QoS functions allow the network administrator to set priorities for certain types of traffic such as VoIP or Video streaming to ensure the required level of performance is achieved even under network congestion. The traffic type can be assigned to each of the three QoS classes and reserved bandwidth allocated. The Vigor2133ac has 4 x Gigabit LAN ports and supports 30,000 NAT sessions. The Vigor2133ac supports both port-based and 802.1q tagged VLANs. Port based VLANs allow the assignment of a VLAN and an IP subnet to each router LAN port. The 802.1q tagged VLANs can extend up to 8 VLANs and four IP subnets to an attached switch. The Vigor2133ac has powerful firewall features including object-oriented SPI (Stateful Packet Inspection) firewall, DoS (Denial of Services), CSM (Content Security Management) and WCF (Web Content Filter). The Vigor2133ac router allows up to 2 concurrent VPN connections (convertible to 2 x SSL-VPN tunnels). This can be used to establish LAN-to-LAN VPN connections between local networks and the main office, so that hosts on the local network can access the main office network without requiring individual dial-up VPN connections. The Vigor2133ac router can also be the VPN server allowing up to two dial-in VPN connections. The SSL technology allows secure Web encryption such as those used for on-line banking. With Vigor2133ac, you can create SSL-VPN in Full Tunnel mode or Proxy mode. Vigor2133ac supports Central AP Management (APM) with a console to auto configure and manage up to 2 directly connected (via LAN cables) Draytek wireless Access Points including VigorAP 800, VigorAP 810, VigorAP 900 & VigorAP 910C. The Vigor2133ac includes a number of management options to provide both local and remote access to monitor and manage the router. The TR-069 feature integrates with the VigorACS 2 centralised management system. This can be used to allow system integrators or network administrators to configure, monitor and manage the Vigor2133ac remotely from the comfort of their offices or homes. It can also be used to Auto-Provision the Vigor2133ac remotely by sending configuration data to the router. There are 3 wizards: Configuration Wizard, VPN Wizard and Firmware Upgrade Wizard. These allow network administrators to quickly and easily carry out complex tasks. Like all Vigor routers, Vigor2133ac supports management options include HTTP, HTTPS, FTP, SSH, Telnet and SNMP.